If you've only casually read this blog you'd know that we have a fondness for truffle - white truffles are a particular weakness. The mere mention of their arrival will see us scurrying to taste them. 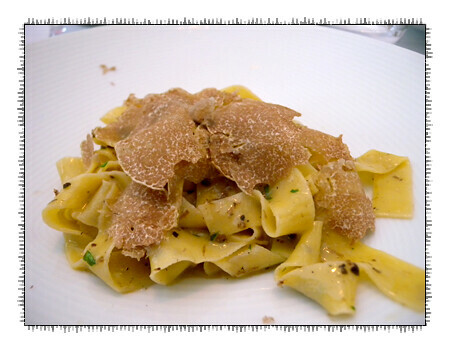 This week a few kilos of alba white truffles landed at Il Bacaro - and not far behind them you'd find us. There are special truffle dishes covering entrees, pasta and mains which the poor waiter had to describe twice since the first time we lost concentration as soon as the aroma of truffle hit us. 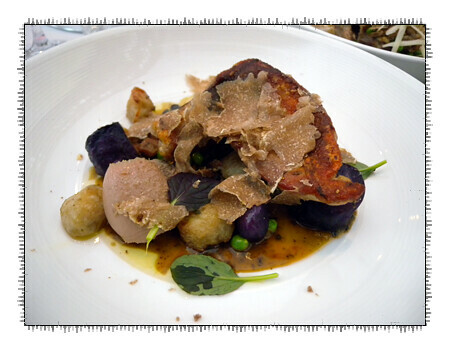 It's also possible to add truffle to some of the existing dishes on the menu. As you'll soon see we ended up with a mix of specials and regular items. 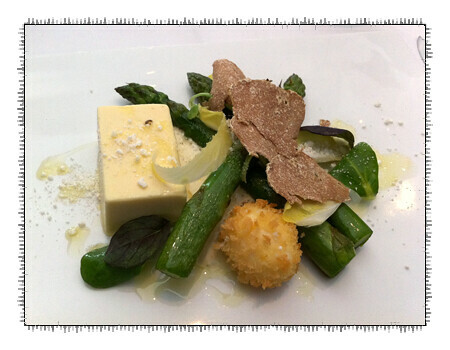 This is from the regular menu - the truffles in all the dishes are shaved at the table. We were both taken by the white asparagus pannacotta - it has an unbelievably smooth texture with an incredibly pure flavour of white asparagus. It was set to perfection - just enough to keep it solid. 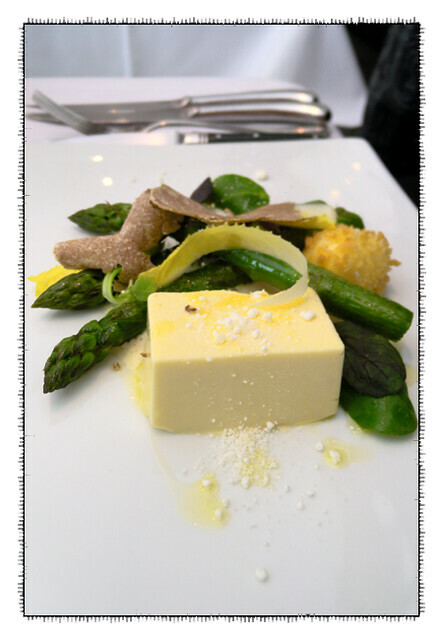 The baked asparagus were warm which contrasted nicely with the cool pannacotta. 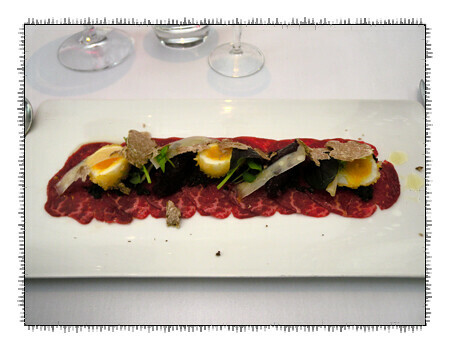 This was a special of wagyu carpaccio with red onion jam and crumbed quail eggs. The meat was as tender as you'd expect - it basically melted in the warmth of your mouth. Gooey eggs and truffle are an immediate win. We're doing the traditional Italian thing and having a pasta course - this was the special pasta, hand cut tagliatelle in a simple butter sauce, crowned with freshly shaved white truffles. Perfection. This was the main special - roasted breast of guinea fowl served on a ragu made from its braised leg, foie gras mousse, purple congo potatoes and lashings of white truffle. The breast was well cooked, crisp skin, moist flesh. The foie gras was luxuriously smooth adding another layer of decadence to the dish. 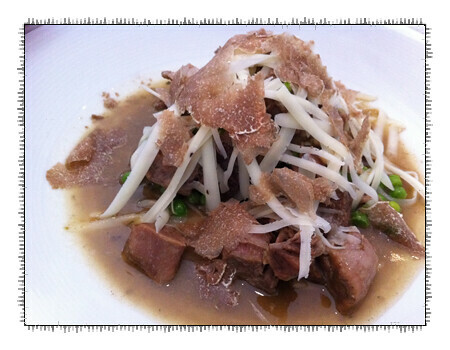 This is from the regular menu - Roman style braised goat with peas and truffled pecorino - topped again with white truffles. Moist and tender goat, it just falls apart at the touch of a fork. 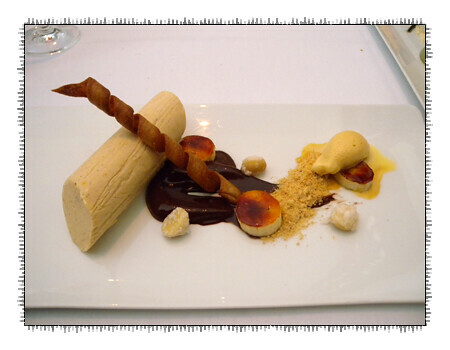 Banana semifreddo with whipped chocolate, candied macadamia nuts, caramel powder and malt ice cream - I love the bitterness of the dark chocolate as a counter to the sweet banana semifreddo. Malt ice cream tastes exactly as you would imagine. Liquorice pannacotta with citrus sherbet and honeycomb - Liquorice is one of those flavours that fall in the love or hate category - this dessert has just enough liquorice flavour to appeal to the lovers and to those that aren't that way inclined. This next dessert came as a surprise from the kitchen - it is the truffle pannacotta served with macerated fruits with truffle. If a dessert was deserving of an 11 out of 10, then this is it. 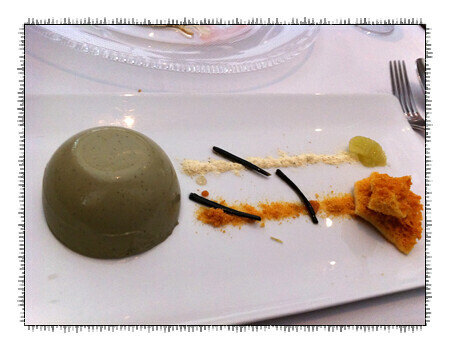 The pannacotta itself was perfectly made, it was just holding together. 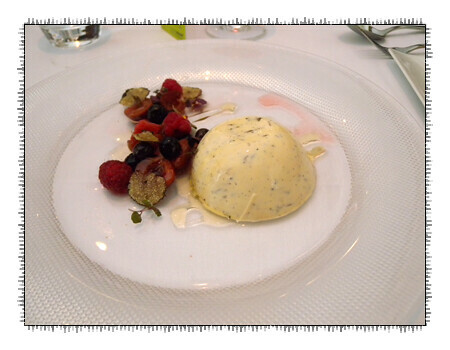 What particular impressed us was the fruit salad, it more than held its own against the pannacotta. I do sound like a broken record on these Il Bacaro posts but they do produce seriously good food. If you're a truffle lover, then you'll probably need to get in quickly before they run out. Oh my god! Just reading this post my stomach is doing backflips. The photos make me want to race out and spend way too much money enjoying this awesome fungus. My last remaining bit of truffle oil will have to suffice for now.